Abington, Agawam, Amenia, Amherst, Amston, Ancramdale, Andover, Ansonia, Ashfield, Ashford, Ashley Falls, Auburn, Austerlitz, Avon, Ballouville, Baltic, Bantam, Barkhamsted, Barre, Beacon Falls, Becket, Belchertown. 6064, 6088, 6026, 6095, 6080, 6078, 6083, 6006, 6016, 6081, 6028, 6093, 6002, 6082, 6074, 6035, 6104, 6199, 6070, 6120, 6112, 6072, 6101, 1106, 6128. This store is located on North St. East of Ella Grasso Turnpike. The manager at this location is Dave Pelis. My experience with Carite has been nothing but positive and memorable. I had been looking for a used car for several months and after recognizing that a couple people I worked with purchased cars from Carite I decided to check it out for myself. Upon arrival I was introduced to Anita. She walked over with a smile and a warm voice and the process began. No pressure , no sales people just good customer service. Anita walked me through how things worked and it was simple. First look at the list of cars , see where they are located on the site map. Go out and look at / sit in the cars and find the one you like. They pull it up and you go for a test drive. No sales rep with you just you. Drive as many as you like until you find the one. It’s as simple as that. No haggling! And another one of the positive things is that most of the cars I looked at were $1,000 to $2,000 lower then anyone one else. That include dealerships and Carmax. This is the way car buying should be. Purchased a 2015 Nissan Sentra - a surprise birthday gift for my daughter. The experience was quick and easy. ANITA guided me through the process and was AWESOME! She went out of her way to make sure everything went smooth. Carite is lucky to have such a dedicated person working for them. I will refer people to her and Carite! Thank you!!! Anita was super helpful throughout the buying process. My sister and I came in to buy our cars from Carite and Anita was always there to help. 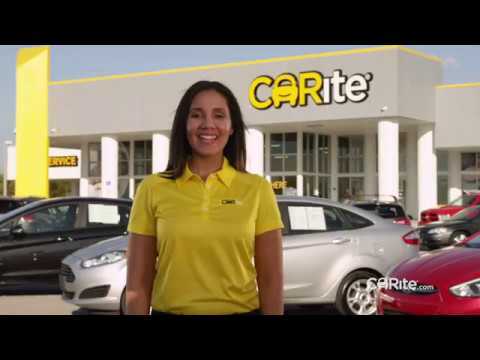 I would definately recommend checking out carite if you are in the market for a new (or used) car and ask for Anita. Yo wouldn't regret it. I went to Carite on a recommendation from a friend. I went there to look at a 2015 Lexus ES, which they had listed for what seemed to me to be a good price when compared with other dealers. However, when I was on my way in to talk to a sales person, I noticed a beautiful 2010 red Lexus LS 460 parked right next to the door. A gentleman (who turned out to be a friend of John, the owner), was walking out the door and noticed me peeking in the windows of the car, and he said "That is the owner's car. He will sell it to you if you want it"! I went on inside, and inquired for the owner. John was sitting at a desk, working with a customer, (and I made a note to myself that it was pretty cool the owner was sitting at a desk no more fancy than the numerous other salespeople's desks on the floor), and I interrupted him and asked if it was true that he would sell me his car and if so, how much? He smiled, said yes, told me an approximate price, and tossed me the keys! I took the car out for a ride (which they let you do by yourself at Carite, which is very nice). I came back with a huge smile on my face, which I couldn't contain ("There goes my bargaining power" I thought)! I'm sure my excitement was evident to John, and he knew I would have paid the full "approximate" price he had given me. However, he had me sit down, he did some analysis on his computer, and came up with a price less than the "approximate" price he quoted me! I couldn't have been more thrilled with the whole buying experience with Carite. Everyone I dealt with that day was as nice as John. In short, if you are in the market for a used car, you can't do better than Carite! I went to Carite as I was interested in looking at a 2015 Lexus ES. On my way in to the dealership, I walked by a beautiful red 2010 Lexus LS460. A gentleman was on his way out and he noticed that I was staring at the car. He said "That's the owners car, and he will sell it to you"! I was happy to hear that, and I proceeded in, where I met John, the owner. He couldn't have been more pleasant, told me the gentleman (his friend) was correct, and he reached in his coat pocket and gave me the keys to test drive it. I came back with a big smile on my face, as I couldn't contain my excitement. John offered me a fantastic price on the car, (despite John probably knowing that at that point, I would have paid anything for the car) and it is now mine. I couldn't be happier with John, and all of his employees. You need to buy your car here!!! Best dealer experience ever.Thank you Ashley for your excellent n caring ways.I would go a third time for another car.carite is best in service n warranty n etc.I bought two altimas in feb2017 n feb.2019.love the service love the cars n warranty.Carite is best.thank you again Ashley..
Feb,2017,I bought a 2014nissan altima,from carite,Ashley n Dave made my buying experience smooth n easy.this feb.2019.went n bought a 2016nissan altimaSR.I really love my cars n again Ashley took care of me n went out her way several of times to make me happy.Thank you so much ashley.Both cars are running excellent, thank you for everything you did,to make my buying experience, best ever.Buy from carite they're the best,warranty n service number one1**. It’s not letting me fill out net income. Interested in VW Jetta or Passat. Great place to get a car - one of the easiest car buying experience I have ever been involved. Great customer service - thank you! I've read many positive reviews about CaRite and feel that none of them truly expresses what a great experience a buyer can have. I live in Massachusetts and the owner, general manager, and staff members were all willing to work with me over the phone, present me with cars over email and actively search for the specific car that I wanted. I could have easily had the same car much closer to home (the dealership is 150 miles from my town) but John/Dave/Stephanie's willingness, CaRites amazing pricing on both cars they are selling and trade ins, their ability to get me exactly what I wanted,and the ease and efficiency in trading in my car and walking out with the new one (2 hours beginning to end) made the decision very easy. This is the first time I've left a dealership feeling good (I usually feel like I got taken advantage of),and should be a model for all other dealerships. CaRite has made a repeat customer out of me. Anita made my car buying process extremely easy. she takes her time to explain things to you. there are so many cars to choose from with great prices. I worked with Anita who did an outstanding job. She was very thorough, knew the available inventory, superb customer service, and introduced me to some of the team she works with. What a great place to work for. Very friendly and helpful atmosphere. Definitely will refer others. I give you 5 ? stars. ?